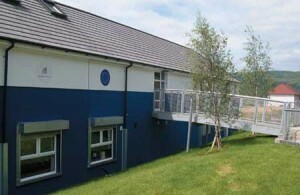 Penyrenglyn Community & Family Hub is a remarkable feat of architectural ingenuity. It is four council houses which were in a dire state of repair, transformed into an attractive, welcoming space, which hosts Play, Youth, Family Support, Community Development Activities depending on the time of day. The team work across the Upper Rhondda Communities First Cluster providing Play, Youth and Community Development activities using venues in other areas as appropriate. In 1997 Valleys Kids were based in just two of the the four houses thanks to the concerted efforts of local volunteers. The whole of the Mount Libanus Estate was under threat of demolition to try to solve the problems of social and economic deprivation. In 2002, the young people of the Penyrenglyn Project made a film ‘Not Ready for Drowning’ which marks an historic moment in time and reflects how awful conditions were and how invisible and ignored the community felt.